The growing season is short. It's already mid-June. Three to four months of of greenery is left. 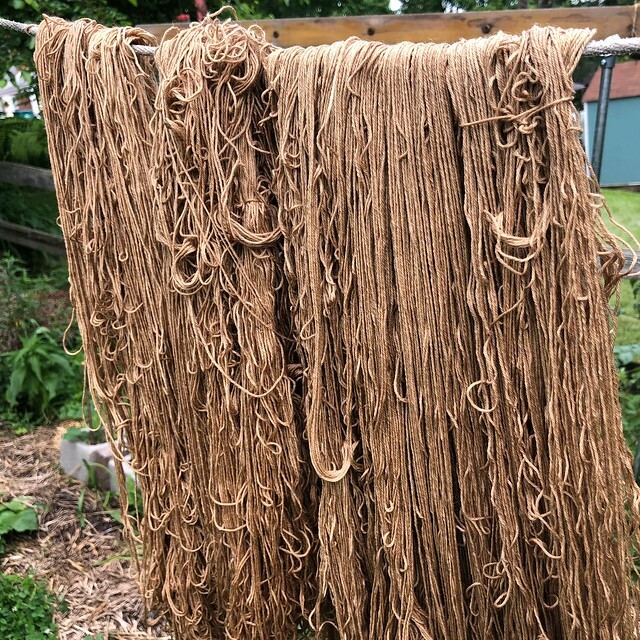 So if you make your living off of natural dyes or eco-printing, you have a lot of work to do in a very short time. One quarter of the year must supply enough material to sell for three quarters. No pressure here. (Sarcasm) But dyeing is really fun because you never know what you are going to get. So time to explore! This year has been really cool and wet so far. On Sunday that will change as we hit 90° temperatures. Time to make hay now that the sun is back. It's hard to do solar dyeing in the rain. (Giggle) The weather also impacts the quality and color of the dye. * Bloodroot, a native species that I purchased and propigated. In the wild, they are protected in some states. Check first before harvesting. * Dandelion - didn't get a chance to harvest this year. Thistle, goatsbeard, and safflower leaves also give color. * Rhubarb is what I started the year off with. We didn't harvest a whole lot because I moved plants around. Yield was about a pound of wool. This year, the color was more tan, not as yellow. * Oregano - I harvested first to restock the spice cupboard. I want perfect leaves for food. For dyeing, they can be bug-eaten and its okay. Again, I'll get about a pound of wool. The color will be a dark brown. * Cleavers is in the bedstraw family. I will have to give it a try. * Lily of the Valley -very toxic but I have a lot so next year I will give it a try. * Coreopsis is currently soaking in a bucket. I moved plants around this year so my harvest isn't as big. In a normal year 3 to 4 pounds of wool is dyed bright yellow gold. * Russian Tarragon - I like to dye with alum and over dyed in a cold copper bath for a mossy green. * Lemon balm - I get a yellow, depending on how mature the plant is. Sometimes tan. * Black Hollyhocks - I get two colors from hollyhocks, a driftwood and a rose tone. Both are lovely. Hollyhocks are biennial. I didn't let enough go to seed last year. You need a lot of flowers for color. * Black Dahlias - I haven't gotten enough to do a proper dyebath. I have used them for eco-printing with great success. * Sage - Salvia officinalis, I process the same as lemon balm. It yield a lemony yellow if I have enough of it. I might only dye 4 to 8 ounces of wool. Zinnias - Next year. Didn't find any seed this year and it skipped my mind. Burdock - I like to do with copper to get a soft green. Lichen (Parmelia) used with ammonia. I scrap it off deadfall. Barberry Leaves - a very prolific plant. Gives a mediocre shade of light brown. * Hopi Sunflower - I didn't get seeds this year. Will try to grow next year. * Walnuts - I use the hulls. I'll have to talk to my neighbor about getting some. When the hulls are just turning from green to brown, a lovely reddish brown can be obtained. I use vinegar as a mordant to shift it to brown. * Carrot Tops - I process them the same as tarragon. * Parsnip tops - I waited too long last year so I haven't tried it yet. * Some people use goldenrod, pokeberries, tomato vines, and french marigold (Tagestes sp.) These are not as colorfast so I don't use them. Wood shavings - cherry, osage orange, and walnut. Cochineal because where I live, it must be purchased. Madder, also purchased because I managed to kill my plant for the third time. Alkanet, also purchased. Use with alcohol in a solar dyebath, not water. There are many more things that can be used. These are just what I used with immersion dyeing on my yarn. Then one of the people I follow on Instagram was fortunate enough to take a class with India Flint. (jealous) Since I actually have the book, it got me to thinking. I am rereading the book and am going to start experimenting with eco-printing. Stay tuned. I have my old handmade solar oven. It doesn't go above 200° but on a clear day, I think it'll be perfect. Time to switch gears and look at cotton fabric. Now to go find some pipe to wrap my cloth around. I just got done scouring fabric. The rose bush needs trimming and the leaves will be perfect. I will be trying different mordants to see the effects. Today is a good day to dye. Stay tuned!